I realized this past weekend that it has been a hot minute since I've featured a career related post. 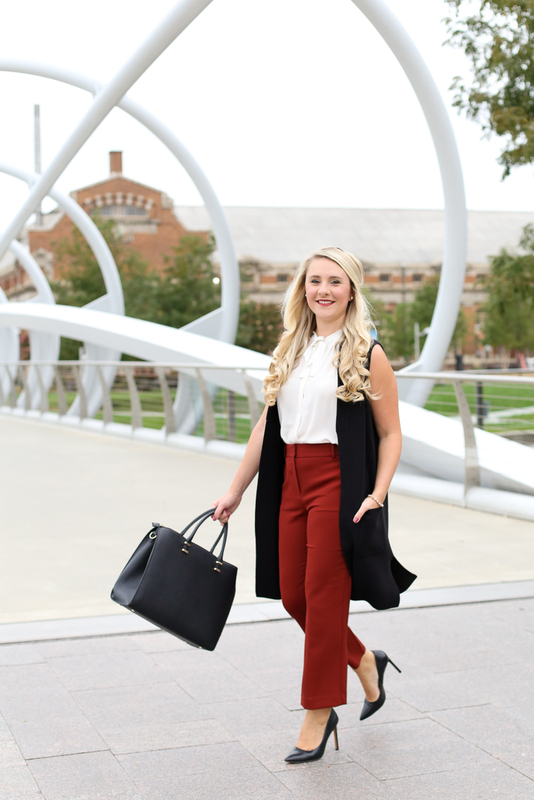 Oddly enough, I started blogging to share my tips and style for the young professional. So it's high time I bring back a little work wear inspo. But I didn't want to just share a "here's what I wear to work" post. Let's get a little discussion in as well, shall we? 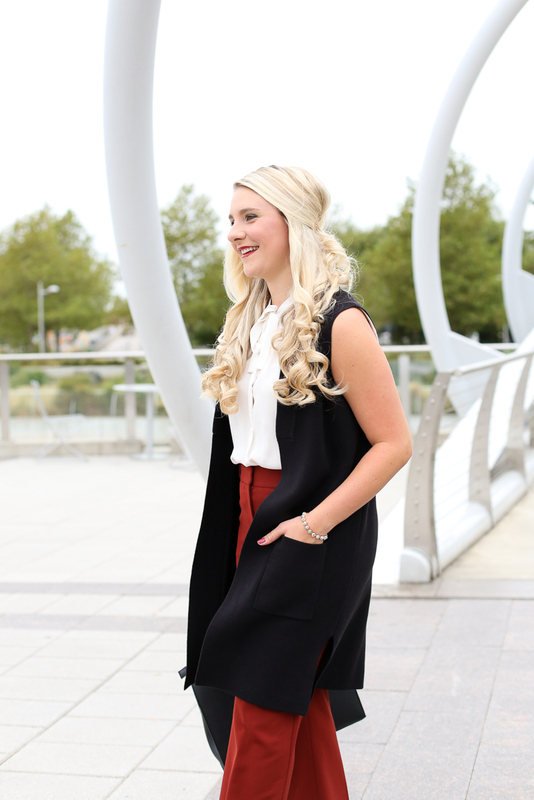 I get asked quite often, how I maintain a full-time job and what seems like a full-time blog. It's a question I also ask myself on the reg, ha! I started blogging as a side project or hobby if you will. I never imagined that it'd grow into something that sometimes can seem like a second job. Not in the sense that blogging feels like work, but in the fact it does take up a lot of hours of my week. I know quite a few other bloggers have touched on this subject before, and it's always nice to hear all perspectives from bloggers with full-time jobs. I currently work 45-50 hours a week, sometimes less or more depending on the craziness of the week. Those hours are strictly spent at my desk, in the office. So that leaves nights, some lunch breaks and the weekends for blogging. Mix in social events, adult duties (i.e. laundry, running errands, cleaning the apartment), Church on Sunday mornings, devotional group on Tuesday mornings, and football games on the weekends, and I'm left with barely any time for getting actual blog work in. Oh, and there's sleep somewhere in all that, ha! So how do I get it all done? The easy answer, I don't. It's all about prioritizing, staying organized, having a plan and thinking ahead. It's also about learning to "let go" when I can't get a post finished, or a set of photos I took turn out blurry. I'm a one woman band, and human. Sometimes, it just doesn't get done. But over the past 2.5 years, I've found a process that works for me. A few things that help make blogging life a little easier and less stressful. I'm no pro, but I've found the process below to work best for me. The biggest way to stay organized and know what needs to be done, is to plan ahead. Toward the end of each month, I print out a blank calendar for the upcoming month. I fill in sponsored posts, collaborations, series, and other posts that need to occur on a certain day. I then fill in with other ideas I have for the month. This is a rough draft, and has never, ever stayed the same. But it helps give me an idea of what I need to shoot, content I need to prepare and makes writing out my weekly to do lists a little easier. On Fridays I will look at the upcoming week and finalize my content for each day. I'll make a to do list for the weekend, making sure I get all photos taken then if I haven't already. So if needed, I'll schedule a shoot with my friend Nicole who lives in my apartment building. My goal is to always have the upcoming week's photos done the weekend prior. This is especially the case during the fall and winter, because I leave for work in the dark and walk home in the dark. My outdoor lighting strictly comes only on the weekends. Writing each blog post is the least time consuming thing I have to do. Editing photos, taking photos, preparing shoots, linking products, scheduling social media, etc., is what takes up the majority of my time. I usually write my posts at night, Saturday mornings if I have nothing going on, or Sunday nights. I always write my post content first, then add in photos and links last. There may be some bloggers who love this, but I for one HATE scheduling social media, ha! It's not the most fun, can be the most time consuming, and tedious after awhile. But since I have a full-time job, I can't sit at a computer all day, sending out tweets and Facebook posts. Thus, I use Hootsuite for 90% of my tweets and all of my Facebook posts. I usually schedule social media on Sunday evenings, as well as at night once I schedule (finish) a post. That way the post topic is fresh on my mind, and I can come up with something better to say than if I scheduled social media weeks in advance. It also helps break it up, ha! Speaking of social media, there's a lot of upkeep with that too. I spend about 30 minutes before I go to bed each night, responding to Instagram comments, tweets, liking photos and editing my Instagram photos for the next day or so. I always post Instagram photos myself, which is why you mostly see them early in the mornings or late at night. I rarely post during the day, unless there's a sale or I have some time at lunch. Both of which are important for getting your brand out there. I wish I could attend every single event I'm invited to, but the reality is I can't. A lot of events, media dinners/lunches, etc., can occur during the day, late afternoon or go from 5:00 p.m. - 7:00 p.m. I don't get off work till 6:00 p.m., so the likelihood I can get across town before 7:00 p.m. is slim. So unless an event is later, or I get to leave work earlier, I tend to have to say no. I honestly feel like I miss out on a lot sometimes, but such is life. In the same regard though, it means when I get to go to a blogging event, I'm extremely excited to be there. These events also mean I get to see some of my friends and catch up with them, so I jump at the chance to go to as many as I can. Pheww, I know that's a long post and I haven't even talked about what I'm wearing here yet. But I hope this gives y'all a little insight into how I maintain both my full-time job and full-time blog! Now as for the outfit, this will be short and sweet... rust is a huge color for fall! 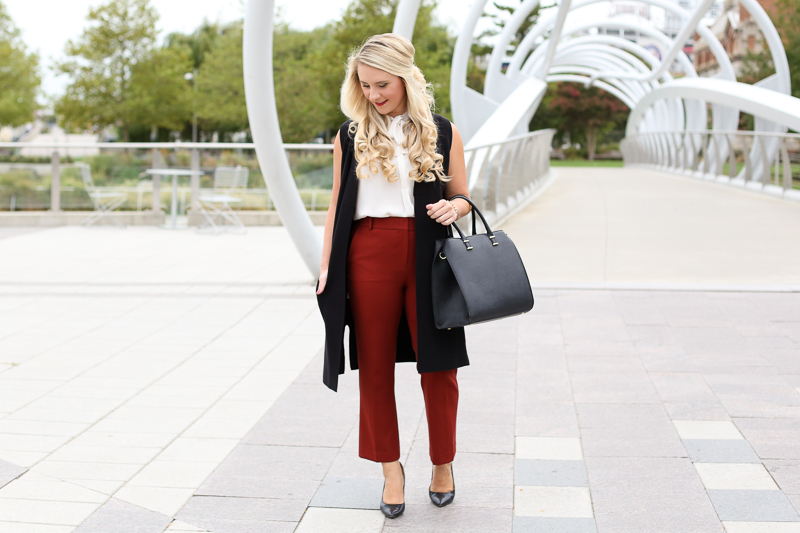 I love a good cropped flare pant for the office, especially with my favorite pumps. I added a simple cream shell and black tote bag, but took the outfit up one notch by adding this sleeveless sweater vest. It's one of fall's simplest accessories, that you can literally pair with just about anything. Jeans, pants, crops, over a dress, etc. 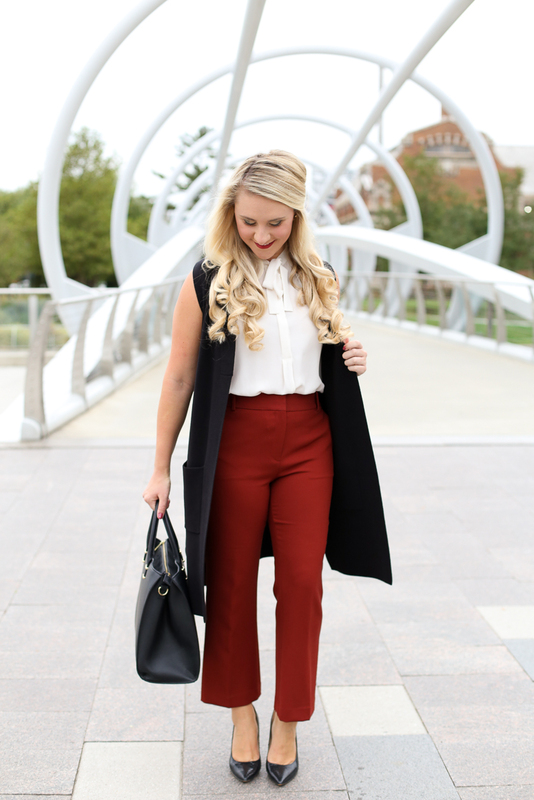 This hands down is one of my favorite fall looks for the office, and not surprisingly, the majority of the pieces are from Ann Taylor. I'd love to hear from those of you who have a full-time job as well, and how you maintain both that and your blog. Or maybe it's not a blog, but another side business or hobby. Let me know some of your tips and tricks in the comments below! 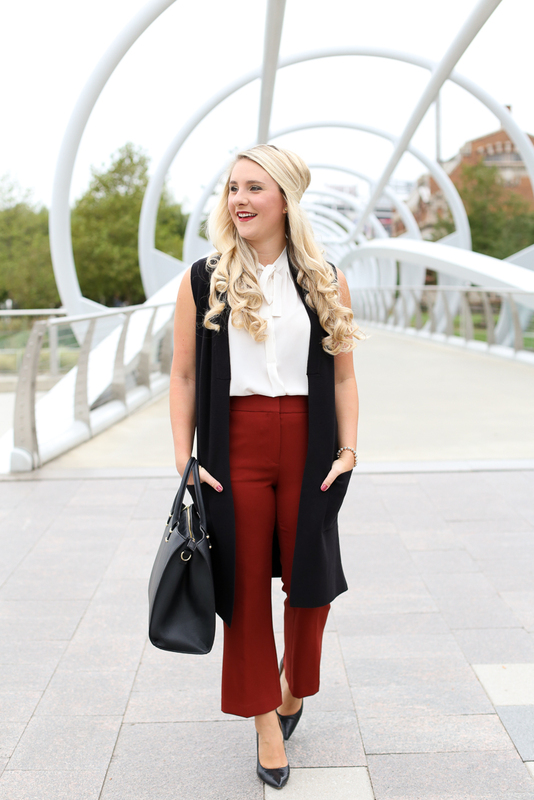 Great post (& fabulous outfit!) Kristyn! Working full time and blogging is no joke! One of my tricks is that one day a month I shoot all my upcoming outfit (usually around 15 looks) . It takes a few hours, but then I'm all set for the month! 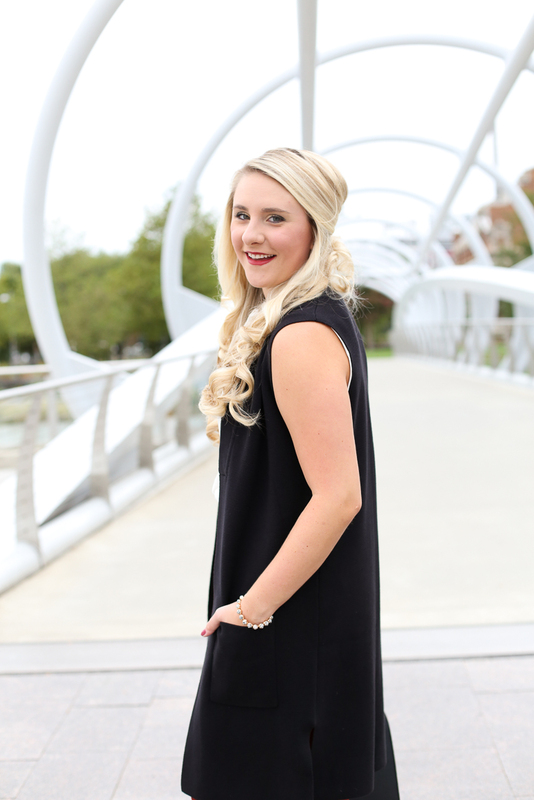 Love this outfit on you, Kristyn! You and Rosa make a great team :) And these tips are great! Shooting lots of looks upfront is a HUGE timesaver (especially when you get them edited ASAP, too!) and I'm also iffy about scheduling social media–it's kind of an annoying but necessary last step! I love this post! As I start to really get back into blogging and a new job in a new city, it's so nice to hear your take on getting it all done! Thankfully my fiance is pretty great behind the camera, and that I have time at night to do things too! Love your outfit! 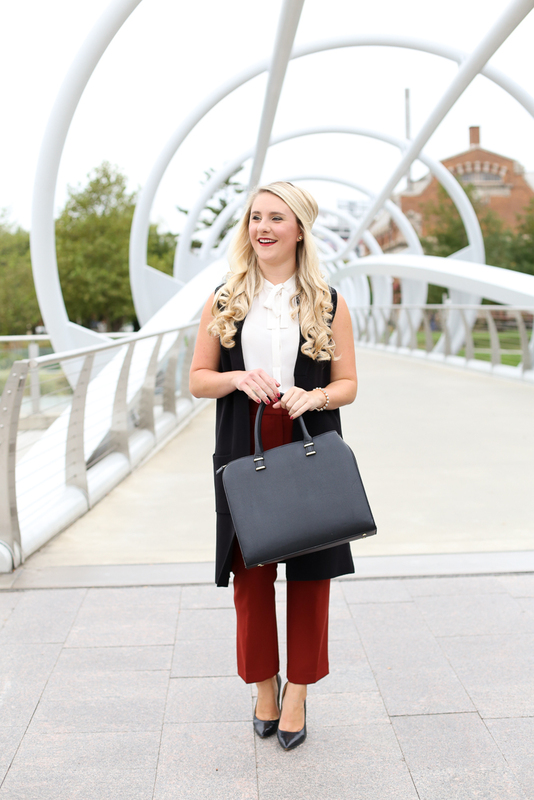 Ann Taylor is one of my favorite, and I wouldn't have thought to add the duster to that outfit. This is a great post Kristyn! As a new blogger I am definitely feeling the pressure to find a balance between my "real" job and my new blogging life/hobby. Thanks for being so real and showing us that we're not alone in this struggle :) Also love your outfit! LOVING this outfit on you! Those pants are so perfect! I hear ya on finding balance but, like you, I'm definitely learning to plan ahead! I feel like the last month or so my productivity and balance has become so much better! You look fabulous! Love these flares! 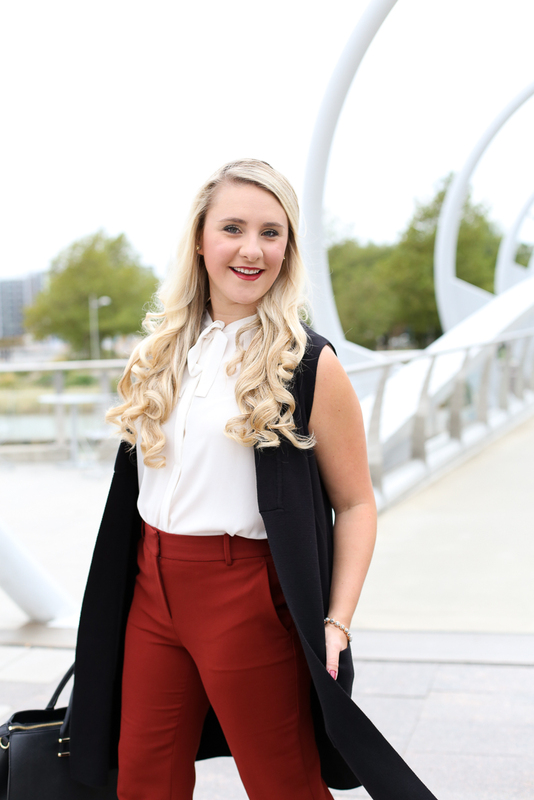 Balancing blogging and a full time job is a struggle but planning ahead is definitely a must! You look amazing! These tips are all so great, the last couple of months (well honestly the last 6 if we're being honest) my blog has had to take a major backseat and I hate that, I've started implementing a lot of these same tips and some others to try and get that blog-job balance and it's slowly starting to work! Thanks girl!! It really isn't. It's all about maintaining a healthy balance and preparing the best you can! WOW!! That's so awesome. You shoot that many in one day?! Holy cow, teach me your ways, ha! Thanks Monica!! It was so much fun shooting with her for sure. Had a blast! Yeah, I think that's the key. Shooting as many looks as you can in one day. Helps save time down the road. Thanks so much for reading Ashley!! Congrats on your new job, and best of luck settling into your new city :) That's so nice too that you have a soon to be husband to help take your photos!! Love it! Thanks Bree :) Glad to hear we're on the same page with how we find the balance of work and blog. This is a great post! I have not been the best with keeping up with my blog since going back to school in September. It is definitely something I have to get better at! Before though, I was stressing myself out getting all my posts up on time and scheduling social media again and again, that I realized it was a hobby. Perhaps if I want to make it into a full time job eventually, but for now, I should just have fun with it! Exactly! When it's just a hobby, it should always be for fun and enjoyable! When you lose sight of that, it becomes extra work and zero fun. I think that tends to happen a lot when you have a full time job and blog. It's all about finding the balance. It helps though knowing there are plenty of us out there in the same boat! You and I are not alone, ha! I'm really bad at planning my month ahead. I'm trying to get better at this! Finding balance is really hard sometimes, especially when it comes to networking events. If I have multiple in the week, I try to prioritize the most important one to me and attend that one. I think it's also important to give yourself grace. If you don't get a post up for 10 days because of a busy work week, it's ok! I totally agree with you Betsy!! So many great points you made :) thanks for reading and for sharing! Hey Kristen! Love LOVE LOVE this post. It's so inspiring to see someone with a full time job (like myself) maintain her blog and passion. Yours style is fab and sometimes it's nice just to know that we aren't alone. Keep at it girl! LOVE this post! Finding balance has been so hard for me with a full time job and my blog. I try so hard to make a monthly calendar and make sure I have all content with brands in a row but if there is 1 weekend I can't get in a photo shoot it derails my entire week (blog wise)! I'm with you on scheduling social media, not the most fun! Thanks so much for sharing this, it's inspiriting to know we are all feeling the same way sometimes! Your tips make thinking of starting a blog manageable with working full time. I really like girly stuff like fashion and lifestyle but work in a male dominated field so I'm looking for an outlet. Thanks! This is such a great post, and I love you're outfit! I just started getting back into blogging while having a 9-5 job that has crazy hours like yours, and it's a great feeling knowing that your best practices are ones I've started to use myself.